Purpose: The purpose of this policy is to guide paramedics in the determination of the appropriate destination hospital for their patients. Refer to the Hospital Destination Matrix below. Policy: UTSW/BioTel paramedics shall transport patients only to approved hospital emergency departments and shall utilize the guidelines within this policy to assist in their determination of the appropriate receiving hospital. Should there be any question as to the appropriate destination hospital for a given patient, BioTel shall be contacted for consultation. Family or on-site private physician preference (if the patient is unable to provide information). Paramedics shall follow their respective City and EMS agency guidelines when determining hospital destination. UTSW/Bio Tel paramedics shall transport patients only to approved hospital emergency departments as outlined by each agency’s respective policy concerning patient transport decision-making. If no such guideline exists, adhere to the guidelines in this policy or contact BioTel for assistance. Patients who do not meet specialty hospital criteria, such as Trauma Centers, Stroke Centers and STEMI Centers, who have normal vital signs and who do not meet any of the "exceptions" listed below, MAY be informed that they will be transported to the closest open and appropriate hospital emergency department. If that patient refuses transport to the closest open and appropriate ED, then they may be considered to be a “Patient Declining Transport” or “PDT”. Pregnant patients who report receiving prenatal care shall be transported to the ED that is associated with their prenatal care provider. Patients who are post-op/post-procedure within 90 days and have a chief complaint that could be related to their surgery/procedure shall be transported to the ED of the hospital that performed their surgery/procedure. Patients undergoing chemotherapy or radiation treatment shall be transported to the ED that is associated with their cancer treatment center. Consider “sister hospital” relationships. For example, if a patient wants to go to a Baylor Hospital emergency department that is far away, but they have a minor medical condition and normal vital signs, you do not have to take them to the closest ED, but rather, take them to the closest Baylor campus. Use good judgment. If there are other unique or extenuating circumstances, transport the patient to the hospital you believe is most appropriate, report those circumstances to the receiving hospital staff upon arrival, and document your decision-making process on the ePCR. NON-TRAUMATIC cardiac arrest or post cardiac arrest. NOTE: Hospital capabilities change. Paramedics are advised to contact BioTel or to consult the current version of BioTel Hospital Capabilities Matrix for updated receiving hospital/Trauma Center capabilities. NOTE: Medical Center of Plano will arrange transfer, if indicated, of any patient with any of the above criteria who might be transported to this facility. Age 0 to 13 years (up to 14th birthday): Patients should be transported to Children’s Medical Center Dallas. Onset of symptoms less than 3.5 hours: Transport to the closest designated stroke center. If the EMS provider is not certain that the desired destination hospital is a designated stroke center, contact BioTel for consultation. Onset of symptoms at least 3.5 hours, but less than 12 hours: Unless immediate intervention (e.g. ABCs, cardiac arrest, etc.) is required, these stroke patients should be preferentially transported to a comprehensive-capable stroke facility, if such a facility is available with less than 15 minutes of additional transport time. If the EMS provider is not certain that the desired destination hospital is a comprehensive-capable stroke center, contact BioTel for consultation. Onset of symptoms at least 12 hours, or unknown last-known-normal time: Transport to the closest designated stroke center. Pediatric patients less than 14 years of age with signs and symptoms of acute strokes should be transported to Children’s Medical Center Dallas (not Legacy) or to Medical City Children’s Hospital: contact BioTel for destination instructions. Patients who are unstable and would experience a significant delay in their care by transport to a preferred hospital with catheterization capabilities shall be transported to the closest hospital with those capabilities. Patient preference for transport to a specific Receiving hospital that has cath lab capabilities. Family or private physician preference (if patient unable to provide information) for transport to a specific Receiving hospital that has cath lab capabilities. Patients without a preference shall be transported to the closest Receiving hospital that is has cath lab capabilities. 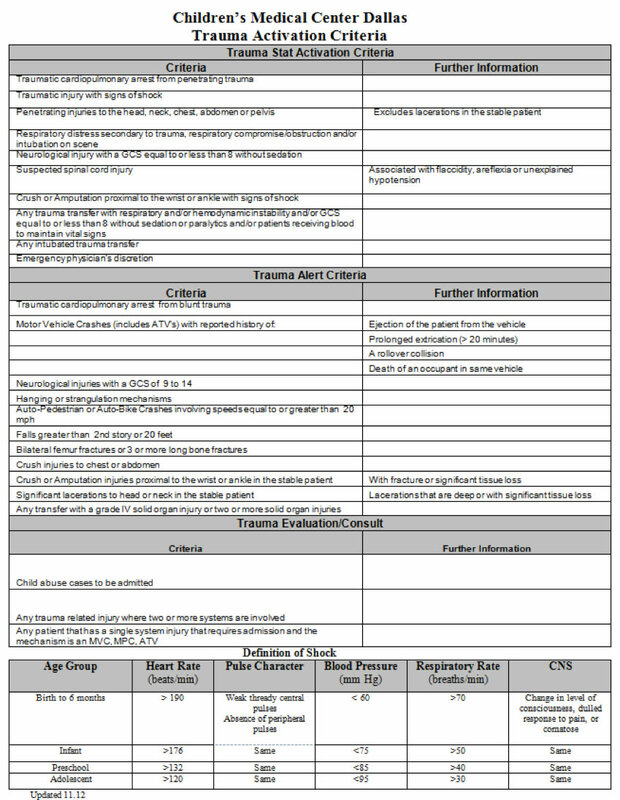 NOTE: If the patient meets trauma triage criteria, transport to a Trauma Center. Patients with simple avulsion lacerations of the distal phalanx will be transported to any open Receiving hospital, or the closest open Receiving hospital, if the patient has no preference. Pediatric burn patients who do not meet Trauma Triage Criteria. All other pregnant patients with a pregnancy related medical problem should be transported to the Obstetrics Specialty Care Facility of their choice, or the closest open Obstetrics Specialty Care Facility, if the patient has no preference. Patients who report that they are Veterans, who do not meet specialty care criteria (e.g. STEMI, Stroke, Trauma), and who express the preference to be transported to the VA Hospital may be transported there. Veterans may call 911 for emergency transport to the closest non-VA hospital. If hospitalization is required, the hospital will contact the nearest VA hospital within 24 hours to arrange transfer. When VA medical facilities (or “sharing agreement” facilities) are unavailable. Patients who are not Veterans shall NOT be transported to the VA, unless they have an unstable airway and the VA hospital is by far the closest emergency department. Nearly all patients for whom 911 is called for evaluation of an acute psychiatric disorder will require “medical clearance” before they are evaluated by psychiatric emergency services and may be transported to any receiving hospital emergency department for medical clearance. Paramedics cannot “medically clear” patients in the field. Paramedics shall perform a standard patient evaluation unless the patient refuses consent for such an evaluation, or unless the patient is combative and it unsafe to evaluate the patient. Paramedics may not transport patients directly to Green Oaks Hospital or to any other primary psychiatric facility. Patients under Emergency Detention may be transported to any hospital emergency department for medical clearance; however, patients under police arrest should be transported to Parkland Hospital. Psychiatric patients maintain the right to determine treatment and therefore they may refuse evaluation and treatment. They CANNOT refuse transport without BioTel MD consultation. Patients under Emergency Detention can also refuse evaluation and treatment, but they CANNOT refuse transport. Any patient exhibiting signs and symptoms of EXCITED DELIRIUM MUST be transported by ambulance to a hospital emergency department. NOTE: **CMC Dallas can evaluate patients up to 18th birthday, if they are NOT violent or in custody. Age 13 years or older: Patients should be transported to closest appropriate facility. NOTE: Texas Health Resources Plano can evaluate patients at least 12 years of age. State Bill 1191 states that all hospitals must have the ability either to conduct a forensic exam on an alleged Sexual Assault patient, or to make arrangements to transfer the patient to the nearest, designated treatment facility, or to a “Center of Excellence”, such as Parkland Hospital or Texas Health Presbyterian Hospital Dallas. Females 0 to 13 years of age (up to 14th birthday): Patients may be transported to CMC Dallas. Males 0 to 16 years of age (up to 17th birthday): Patients may be transported to CMC Dallas. Females 0 to 13 years of age (up to 14th birthday): Patients may be transported to CMC Legacy. Males 0 to 16 years of age (up to 17th birthday): Patients may be transported to CMC Legacy. Patients believed to be simply intoxicated by alcohol and/or other street drugs may be transported to Parkland Hospital for possible enrollment in the Dallas Serial Inebriate Project. Paramedics CANNOT “medically clear” patients for transport by police to jail or to the City Detention Center. However, paramedics may, after a complete evaluation, make a determination that a patient does not appear to require transport by ambulance. A law enforcement officer reports that he/she is NOT comfortable transporting the patient by means other than ambulance. In the event of a Multi-Casualty Incident (MCI), destination decisions will be determined by the Incident Transport Officer, in consultation with BioTel and the EMS Medical Director on-site, if available.